Terrorism. The word alone evokes widespread fear due to its horrific nature and the international reach of events that destroy families and communities. Often, parents wish to avoid discussing Terrorism, or feel at a loss as to how to explain and reassure children who are regularly practicing lockout and lockdown drills at school and have access to information through media sources. Understanding that the groundwork for trauma is often paved by events that are unexpected, recur, involve intentional cruelty and may happen in childhood, parents need to be supportive and responsive to their child’s reactions so as to minimize the likelihood of lasting negative effects. The following approach, developed by this author, can be shared with parents to help them navigate situations that require a response. These P-E-A-R-L-S of Wisdom offer a framework for parents and caregivers who must provide upsetting information in a palatable, developmentally appropriate, and reassuring way. The acronym “P-E-A-R-L-S” stands for: PREPARE, EXPLAIN, ANSWER, REASSURE, LISTEN, and SAFEGUARD. For more information, please refer to the book, Please Explain Terrorism to Me: A Story for Children, P-E-A-R-L-S of Wisdom for Their Parents (Zelinger, L. 2016). PREPARE – First make sure that you, as an adult, understand the concepts that you wish to impart. Get your information from news sources that you trust. ANSWER – Answer your child’s questions as best as you can, and keep it simple. You can always build from there. If you do not know something, you can say so. REASSURE – Offer reassurance that includes ideas that make them safe at both home and school (National Association of School Psychologists fact sheet, 2015). Remind your child of the specific plans you have developed for communication and child care. LISTEN – Now that you have given your kids some information, it is your turn to listen. Do not interrupt and do not judge – let the child talk. Find out what your children have heard from other people and sources, and what they took away from your conversation with them. SAFEGUARD – Children take their cues from the adults they trust, and may be looking at you to figure out what you are feeling, or look to you to see what they should be feeling. You can offer that, “There are a lot of people whose jobs are to protect us” (and see if your child can name them). Pulido (2015) suggests describing how the number of helpers far outweighs the number of terrorists. The American Academy of Child and Adolescent Psychiatry Facts for Families Guide, page 2 reminds us that, “Children are reassured by structure and familiarity.” Therefore, maintain consistency, routines, and schedules whenever possible. For children who may be ruminating about their own personal vulnerability, encourage non-directive expression of ideas where they can freely draw or play out their thoughts. Helping children to express themselves is a concept endorsed by many professionals in order to process the information and facilitate self- soothing (Hendriksen, 2015; Brotherson, 2015). If children choose figures or dolls that are being attacked, or they repeatedly re-create or draw explosions, do not question, interrupt, or direct the process. Often, children need to do this for a while, in order to gain a sense of control over their fears. When children can be empowered by increasing their perception of their own adequacy and self-confidence, they will better able to contain their anxiety (Aletta, 2009). If the play appears to be stuck for weeks at this level however, you might suggest, “I wonder what the good guys would need so they can win this fight?” and have your child invent the solution. Parents often want to rush the healing process and offer solutions that may be readily apparent to them. However, when children create the remedy themselves, they feel empowered. Despite one’s best efforts, children still glean bits and pieces of information from the world around them and may react to them in different ways. This group’s private practice has seen an increase in referrals for generalized anxiety, separation anxiety, regressive behaviors and sleep disturbances in children. Recalling that play is a child’s first language, offering opportunities for non-directive play is the most natural way for a child to integrate fact, feelings and solutions. As a Board Certified Psychologist and Registered Play Therapist, I have used the following play therapy techniques with success. Using Play-Doh and character molds, you can have children create their own bad guys, and then destroy them. In the playroom, children have used bulldozers, trucks, and rolling pins to run them over, scissors to amputate, hammers to pound, or bare hands to wreck them. Some children have even jailed the assailants while others have unleashed dinosaurs, alligators, and swords on the unsuspecting criminal. A shoe box with several alternate lids can become a home, school, store, or prison with little customization. Some children let the clay figures dry and smash them to the floor, reducing them to mere crumbs. A boy who feared that his house would be robbed of money and jewelry spontaneously created a technique using a balloon, marker, police car, and trinkets. He began by inserting money from a toy cash register and a ring from the prize box into a flaccid balloon. Then, once the balloon was inflated, the child drew his house on it with a marker and immediately attempted to break into its door and window. As he pressed and poked, this psychologist made a burglar alarm sound and sent the police car, showing him that attempts at invasion could be thwarted and help could arrive. In the end, the youngster popped the balloon, revealing that the contents were intact and that the money and jewelry were still in his house. For a child focused on terrorist threats or emergencies, creating a toy chest of uniformed community helper figures could reduce feelings of vulnerability. The child can reach in, select a figure, and state how that person helps. For example, “I’m a nurse and I help by…” The toy chest might also have a slingshot, nerf gun, makeshift jail or bow and arrow to harness the child’s perception of personal power, critical to dismantling his fears. It is a primary goal of school psychologists to support families and make children aware of, but not paralyzed by the world in which they live, so they can continue to enjoy their childhood. This can be accomplished by giving them information that is helpful, simple, realistic, and not overly dramatized. Children should feel protected by the adults they trust and be able to make good decisions when they are without us. Parents, caregivers, school psychologists and therapists are in a position to make a difference. Zelinger, L. (2016). 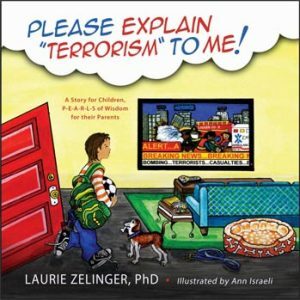 Please Explain ‘Terrorism’ to Me: A Story for Children, P-E-A-R-L-S of Wisdom for Their Parents (A. Israeli, Illus.). Ann Arbor, MI: Loving Healing Press. Dr. Laurie Zelinger, Diplomate, is a Board Certified Psychologist with a specialty in School Psychology, and a Registered Play Therapist with 45 years’ experience. She is a licensed New York State psychologist who, after retiring from a Long Island public school system, is now devoting her time exclusively to writing, consulting, and her busy private practice. Her previous books include: Please Explain Anxiety to Me: Simple Biology and Solutions for Children and Parents, The “O MY” in TonsillectOMY & AdenoidectOMY: How to Prepare Your Child for Surgery (in its second edition), a smart girl’s guide to liking herself even on the bad days for American Girl, and a chapter on selective mutism in the compendium, School Based Play therapy, second edition. She is also credited with being a consultant for the Bitty Baby book series by American Girl where she assisted in the development of the ‘For Parents’ sections as well as editorial development of another American Girl book. Dr. Zelinger is a Fellow in the nationally based American Academy of School Psychology where she served on the Executive Board for two years, and she served four years as Director on the Executive Board of the New York Association of Play Therapy. As a media referral specialist for the American Psychological Association, she has contributed to nearly 200 venues regarding child development and has made several presentations on child related issues at conferences. Dr. Laurie used her experience as a certified Red Cross Disaster Mental Health volunteer in her work at a shelter following a local disaster. She and her psychologist husband, Fred, have been happily married for over 35 years and have raised four children. They are joined in their private practice by their son, Jordan, a neuropsychologist.